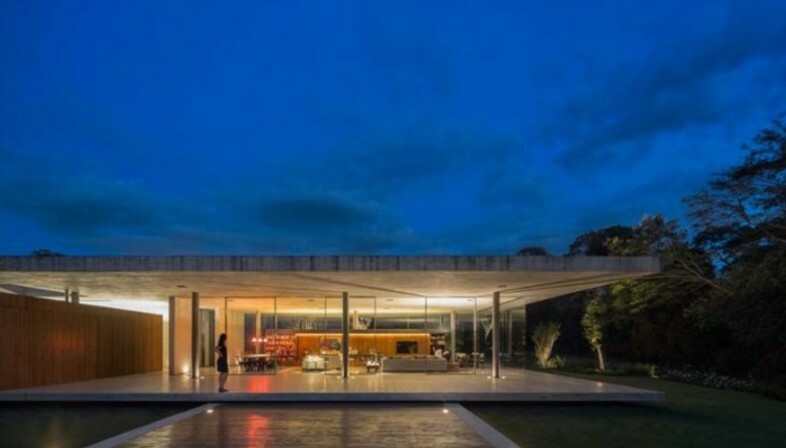 Redux House by Marcio Kogan and his studio, mk27, is located on the outskirts of the city of San Paolo, Brazil. Redux House has all the typical features of a Marcio Kogan project: concrete floor panels, wooden sunshades, an open floor plan, and plenty of interaction between indoors and outdoors. Redux House, on the outskirts of San Paolo in Brazil, is an interesting example of the typical style of Marcio Kogan (studiomk27), who has built many of his most significant projects in the city. In Redux House the architect uses a basic construction system with concrete floor slabs and units with specific functions arranged in an open floor plan, in which the landscape becomes an integral part. Marcio Kogan’s architectural style seems to inherit the enthusiasm that was in the air in the United States at the end of the Second World War, when victorious America offered a new lifestyle, with all the confidence of its times, expressed in homes which integrated indoors with outdoors and different spaces with one another. The simple construction and formal design of Redux House recalls the Case Study Houses programme, in which houses were built that we would still consider “dream homes” today, such as Craig Ellwood’s Hunt House or Pierre Koenig’s Stahl House. After all, the climate of this region of Brazil is not very different from that of southern California. As in the Case Study Houses, use of concrete ceiling and floor slabs permits complete freedom in designing the layout of the house. Thin structural pillars are hidden inside four boxes which divide space according to function (bedrooms, kitchen and bathrooms, suite, garage and utility area). Floor to ceiling windows on three sides in the living room offer views of the concrete block of the swimming pool, drawing a picture much like the homes of 1950’s Los Angeles. Built at the highest point on a hill, Redux House is designed to make the most of its natural surroundings. There is no ocean here, but the Itatiba countryside and a forest to the west of the hill. Its L-shaped layout is made up of a single indoor level and a swimming pool: a rectangular concrete block extending at right angles to the home and on the same level as it. As the house is built on the top of the hill, the long volume containing the swimming pool starts underground, but gradually emerges, and its end is suspended over the void. The dramatic effect recalls Julius Shulman’s famous photos of the Stahl House, especially the one of two elegant bourgeois ladies chatting in a glass living room suspended over the twinkling lights of the city of Los Angeles. Marcio Kogan inherits the principles of the International Style and elaborates variations on them. He screens in the four boxes with wooden surfaces that open up to form sunbreaks, maintaining the idea of transparency while adding the concept of total darkness. The theme of lightness, expressed in the suspended structures, is dealt with by contrast at the points at which the two heavy slabs come into contact with the outdoors and with the other elements in the composition. The gap between the roof and the walls of the indoor boxes, in which the slab rests on pillars, not only serves to provide ventilation and permit the passage of daylight, but is also a formal element lightening up the gravity of the level. The floor is supported by girders set back from the perimeter of the house, visually lifting the building off the ground and holding it apparently suspended in the air.